Not if you live in Florida...but if Indiana is home, then skating on an outdoor pond when it freezes is part of our winter festivities. Indiana is unseasonably warm right now--it could reach 60 degrees before Christmas comes. 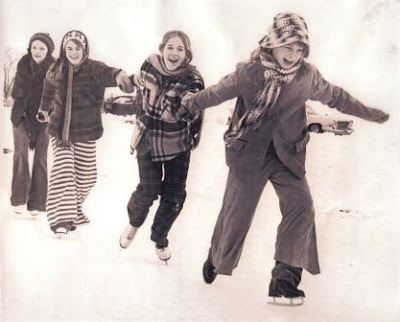 But it was cold enough for Becky (baggy, striped pants), her two sisters (in front) and a friend to get their photo taken and placed in the Indianapolis Star about thirty years ago. They are skating on Lake Sullivan, adjacent to Cold Springs Road on Indy's northwest side, now site of the Major Taylor Velodrome and Lake Sullivan BMX Track and Terrain Park.